Your relationship with Heidelberg doesn’t end the moment you walk across the stage to receive your diploma. In fact, it’s just beginning. 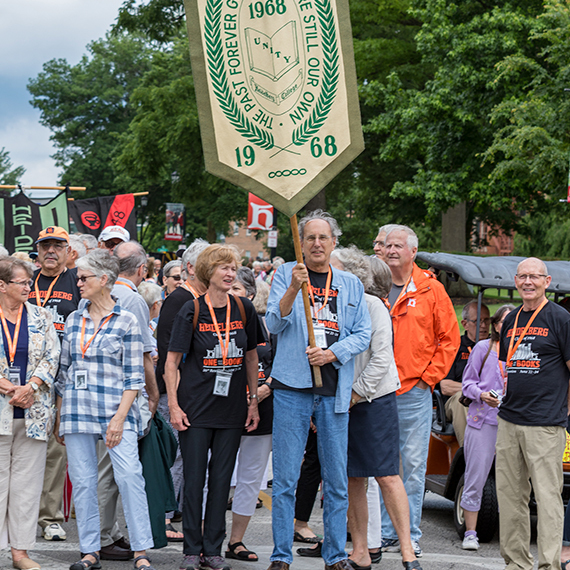 Our pledge is to keep you connected, engaged and proud to say you’re an alum of Heidelberg University. There are a number of ways to make a difference, not only for other alumni but for current and future students. Refer a Student: If you know a student for whom Heidelberg is a good fit, please let the Office of Admission know, and we’ll reach out to them. Email us at admission@heidelberg.edu with their name, address and any other information you can share. Find a Classmate: Send us an email at alumni@heidelberg.edu with your request. We’ll do a little bit of research and contact you with more information. Like the Heidelberg Alumni & Friends page on Facebook! We love having our alumni back on campus and hearing how things have changed, and how they've stayed the same. Stop by if you are in the area, or plan to attend one of the many events throughout the year. The largest-ever crowd gives the largest-ever gift. There is no shortage of love for Heidelberg and the people who make it great.